The first battle of the Corellian Conflict was a bloody affair, as General Dodonna was committed to bringing resources back to the Alliance, but was not prepared for Darth Vader to be guarding the caravan himself. Imperial objective ships - 2 Gozanti-Class Cruisers (Vader at top), Demolisher "Demo-Kun", and top-most Arquitens. Other Imperial forces - TIE x5, "Howlrunner", 2 additional Arquitens with Dual Turbolasers. Rebel forces: MC30c Scout w/ TRC, GR-75 Transport w/ Comms Net, CR90-A w/ Dual Turbolasers, Mon Karren, E-Wing x3, Corran Horn, Hera Syndulla, Ketsu Onyo, Rogue Squadron. The fleets assembled, and while Dodonna wasn't expecting the response of Vader and his task force of Post-Clone War era ships lead by a Gladiator Class Star Destroyer named "Demolisher", he did have enough of a Spynet to warn him about the deployment of the convoy, and that the biggest threat would be in the middle. As such, he was able to deploy Mon Karren on the far flank, away from the biggest threat. What he didn't realize though, was that most of the resources were being transported by the Demolisher herself, as well as the Gozanti-Class Cruisers flanking her. Only one Arquitens-Class Light Cruiser was carrying anything of note, and it was taking up the rear of the flanking formation. Actually getting anything from this engagement would be difficult. Fighter cover on the other hand was firmly in the Rebel's favor. Captain Syndulla was leading a group of the Rebel's newest E-Wing fighter into battle, supported by former Corellian Security Forces Agent Corran Horn, and a bounty hunter named Ketsu. Famed Rogue Squadron, sans its most famous members of Luke and Wedge also participated. Initial engagement took place on Turn 2, with two of the Arquitens getting firmly into range of the Mon Karren, and the MC30c jumping up to try and block off the escape of the flotillas and Demolisher. TIE Fighters were sent in to harass the MC30c for minimal damage, and were then engaged by the bulk of Dodonna's fighter cover. Modern E-Wings quickly proved too much for the older TIE models, who started taking casualties. On Turn 3, the TIEs themselves changed their tactics toward removing Captain Syndulla's command ship from the battle, but the Ghost held on despite taking several big hits. The MC30c unloaded a massive attack onto one of the Gozanti flotillas, which were able to scatter away from it for no damage - however, that allowed the Mon Karren to analize the defensive pattern - this would not happen again (scatter burned after a double arc shot). Unfortunately this put the MC30c into the path of both the Demolisher's side arc and into the thick of the Arquitens. It did not survive to the end of the turn. Meanwhile, the E-Wings and other fighter cover, who had dealt with most of the TIEs, began to bomb the scattered Gozanti flotilla, disabling the ships they were protecting with their torpedoes and securing valuable cargo for the rebellion. Turn 4 saw the Mon Karren destroy one of the Arquitens that had been harassing it, but Demolisher was able to not only destroy the GR-75 flotilla that had been providing tactical support, but came about to set up a slightly obscured broadside on the CR90-A Corvette, which had until this point been coming about to flank the main battle group. It was able to deal maximum damage with its torpedoes, crippling the smaller ship, but stopping just short of removing it from the board. The CR90-A was able to react, ineffectually damaging the Demolisher and slowing down to a full stop, to avoid hitting the asteroid in between them... and out of Arquiten range. 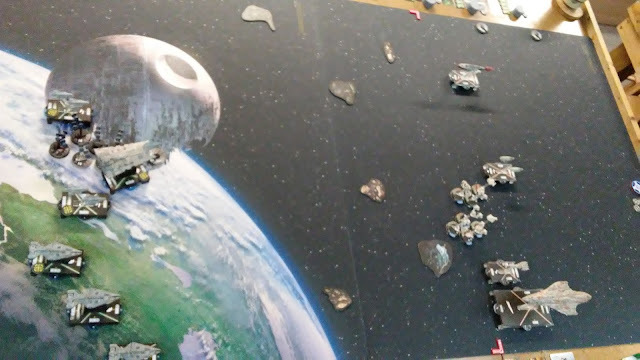 The remaining Arquitens were able to strip the shields from the Mon Karren, while the Rebels fighters finished the last of the TIE fighters, and moved to bomb the Demolisher's side and rear, stripping valuable shields and doing some minor damage to the hull. Turn 5 began with the CR90-A firing on the Demolisher, raking its hull, and then speeding up to ram. Unfortunately, it hadn't done enough damage, and between colliding with the Demolisher and an asteroid, it was destroyed, but Demolisher was crippled and forced to withdraw without engaging the Mon Karren. While it tried to retreat, the Mon Karren was able to eliminate it with long range turbolasers from its right side batteries, and disabled the transports that it had been assigned to protect. This left Vader's Gozanti flotilla and one of the Arquitens protecting the valuable resources the Rebels needed, but neither one was really in range to engage. Instead, the Rebels decided to cause as much damage as they could before withdrawing. While the Arquitens were able to damage the Mon Karren's hull, it held strong, and the rebel fighters were able to move to engage the remaining Arquitens that was not guarding any transports, stripping shields, and lightly damaging hull. Mon Karren unleashed a massive frontal battery attack on that same Arquitens to start the 6th round, eliminating that Light Cruiser, but it held on long enough to let Vader and the remaining transports slip away. In the end, the Rebels were able to claim 80 resources from the engagement, which they considered to be a minor victory for the Rebellion, but with more ships damaged than their Repair Yards could conceivably handle without using some of those hard won resources. A pyrrhic victory for the Rebellion for certain, and not even an engagement that changed the overall balance of power in the sector. Nevertheless, for morale purposes, Dodonna awarded veterans medals to the Captain and crew of the Mon Karren, as well as to Captain Syndulla and Captain Horn for their skill and bravery. The heavily damaged MC30c, CR90-A, and GR-75s were towed to the Nubia repair yards for repairs and refits. On the Imperial side, the loss of so many TIE squadrons were of no concern to Vader, but the loss of 2/3 of his combat ships, including the Demolisher, weighed heavily on him. All of his ships that were able to claim a confirmed kill during the battle had been heavily damaged by the fighting. He was most displeased, though his subordinates tried to explain that his opponent had taken some considerable damage as well. In the end, the first engagement was over without much decided. It would be the Assault on Selonia Outpost, and the Rebel Incursion at Polanis that would decide the state of the conflict in the days to come. Great report. The resource management aspects of the campaign definitely add another interesting set of tradeoffs. Gonna have to make sure someone grabs a Hoth mat to leave at the store. I have space, Yavin, and Endor at the store for gaming purposes. Can't quite justify another $40 mat to leave at my local game store. It has been pointed out to me that I have been using the wrong name for Demolisher this whole time. Demolisher had apparently been renamed "Demo-kun" during fleet generation. Dodonna-Sempai and his Bombers noticed her a bit too much.